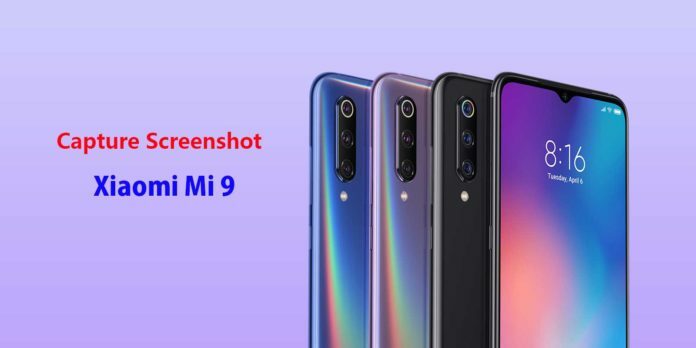 Taking a screenshot on an Android device is quite easier but it's even quicker on the Xiaomi Mi 9 or any other MIUI running devices. Here in this guide, we will provide you the top three steps to capture screenshot on the Xiaomi Mi 9 device easily. Taking a screenshot is now very useful and handy feature for all of us. Thanks to the Android developers and smartphone OEMs to make it possible to edit/delete/share the screenshot instantly via a preview image. It’s quite necessary to take the screenshots whether you’re a gamer, streamer, developer, beta tester, or a normal user. Now, all of the Android devices do come with this native feature. Meanwhile, some of the Custom Skinned smartphone OEMs offers extra options or shortcut tools to take a screenshot quite easily and effectively. This is the most commonly and widely used by most of the Android device users. This is a quite traditional way and full-proof method to take a screenshot on any of the Android devices easily. Now, you may ask why the full-proof method… That’s only because of during the unresponsiveness of your device screen, the physical buttons always come in handy whether it may be power on/off or taking a screenshot. Go to the desired page or place on your Mi 9 phone which you want to capture. Press and hold the Volume Down and Power button altogether for a few seconds and it’ll capture a screenshot of that whole screen easily. Thanks to the Xiaomi for offering the Screenshot Shortcut option in the Notification Panel Quick Settings toggle. This really helps to the users most of the times when users are quite busy or can’t press the hardware buttons by two hands (mostly). This shortcut will definitely save time and effort without any lag or worry. Open the Quick Settings menu toggle from the notification panel. A preview image of your screenshot will appear at the top corner of the display for a few seconds. As usual, you can open the screenshot directly from the preview and can edit/delete/share instantly. In order to enable the shortcut, go to device Settings > Button and Gesture Shortcuts > Take a Screenshot. That’s it. Now, you can simply use any of them at any time on your Xiaomi Mi 9 phone to take a screenshot quickly.